Hockey World Cup 2018: Has India been the most impressive team so far? Can India control their nerves in the knockouts? The former champions are settling in, the minnows are making a splash, and Spain, sadly, is going home - but which is the one team that has impressed the most at the Odisha World Cup thus far? Sportskeeda checked with Siegfried Aikman, Jude Felix, and Ashish Ballal as to what they made of India's show at Bhubaneswar, vis-a-vis their closest rivals, in order to shed some light on what has been a string of inconsistent performances by the top-ranked teams. The Netherlands flattered only to deceive, as a 7-0 thrashing of Malaysia was followed by a 1-4 defeat to Germany, while the Germans themselves began with a hard-fought 1-0 win against Pakistan. The Australians began with a cagey 2-1 win against the Irish and were not at their imperious best against old foes England either - at least, not until a packed final quarter when they displayed signs of their old brilliance, and destroyed Danny Kerry's side with three spectacular goals, all of which were scored from open play. With an 11-0 win over the Chinese, the Aussies are getting back into prime form and Colin Batch's Kookaburras are beginning to look like the World Champions of old. Argentina managed to pull off a close 4-3 win again Spain before asserting themselves with a 3-0 victory over New Zealand, but a loss to France may not have been the best result for the Los Leones even after being assured of a quarterfinal place. FIH master coach Siegfried Aikman who watched both of Argentina's opening matches shed some light on the strategy which the South Americans have adopted of late. "Argentina plays maturely, and uses little energy - but this is their normal style of play. Their style is different from India. The Indians like to dribble from behind while they (Argentina), will pass first. The Argentinians used to dribble first but were not so successful." So, how have the hosts done performed thus far, amalgamating their traditional free-flowing game with the concept of total hockey? 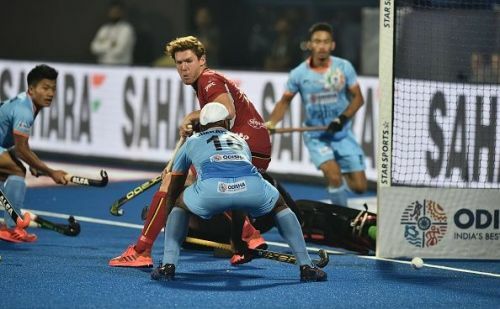 A 5-0 win against South Africa was just the perfect start that Harendra's boys would have wanted, but a less-than-satisfactory first half against Belgium has some experts worried. When asked specifically if India has been the most impressive side thus far, the former India captain stated that he was not particularly pleased with India's game in the first half against the Red Lions. "India has been impressive in terms of results, but not by the way they played in the first two quarters against Belgium." Former India goalkeeper Ashish Ballal felt the Indians deserved a win against Belgium last Sunday but were unfortunate to concede a late equalizer. "A great and entertaining match for the spectators. Coming back from a goal down after missing a few sitters in the first half - then coming back strongly in the second half to go into the lead." "India had chances to close the match - but again missed chances, and were jinxed to concede late." The Asian Games gold-medalist of 1998, however, emphasized that while the Indians may have impressed, there are other teams at Bhubaneswar who have been just as impressive. "India has been Impressive - yes. It is debatable as to which team has been the most impressive - Germany, Australia, and Argentina are all up there." Following Holland's loss to Germany, Aikman, who coached the Japanese side to victory at the Asian Games feels that the Indians have been the most impressive team at the World Cup so far. The biggest challenge for India, in recent times, has been their inability to withstand big-match pressure and whether the mammoth crowds in Bhubaneswar inspire the Indians to go all the way, or cause them to choke remains to be seen, as Aikman pointed out succinctly before the tournament began. "India could be the team that goes all the way if they manage to control their nerves and enjoy the support of the home crowd." Follow Sportskeeda for all the latest Hockey World Cup Points table, schedule, stats & previews.